Hello hello! So, it's Christmas today and I am deeeeep in the Christmas spirit. I've made a Christmas pudding and Nigella's chocolate fruit cake, the house is decorated, presents are all purchased and wrapped, and I had a mince pie for breakfast. Even more excitingly, Sandra's parents are visiting from Germany now so I took the opportunity to make a special Christmas meal for them. 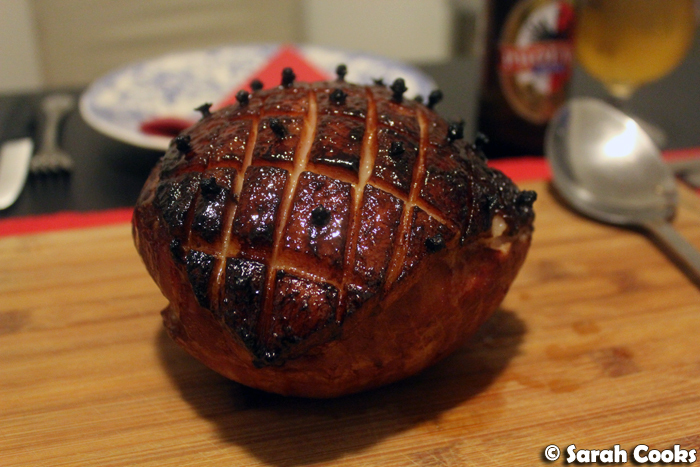 For tonight's Christmas Eve dinner (and those of you in the know will know that the 24th is the big celebration day in Germany), I made a ham. A ham with mac and cheese has become our traditional pre-Christmas meal - it's special, it's easy, and it's so delicious! This was essentially a repeat of the pre-Christmas ham dinner of 2015, just with plain mac and cheese rather than the sweet potato version. Also no dessert, because we've been eating so much while Sandra's parents have been here that it didn't make sense to make a full dessert. (Also I forgot). The ham was my favourite, a Peter Bouchier smoked ham nugget. 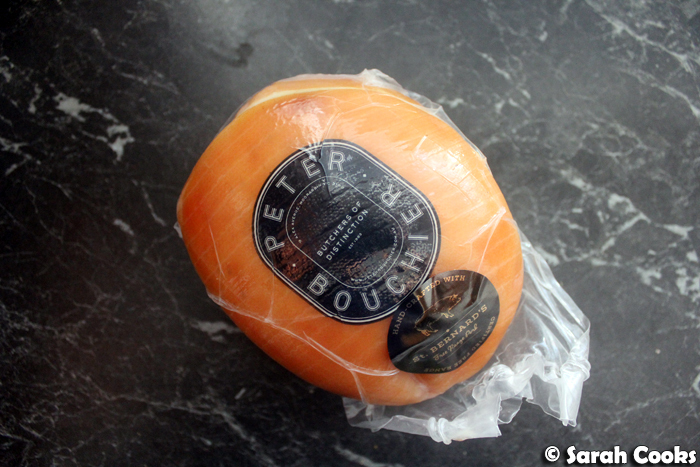 It was easy enough to pop into the Peter Bouchier counter at David Jones in the city on my lunch break earlier this week, no need to order in advance or drive out to a suburban butcher. 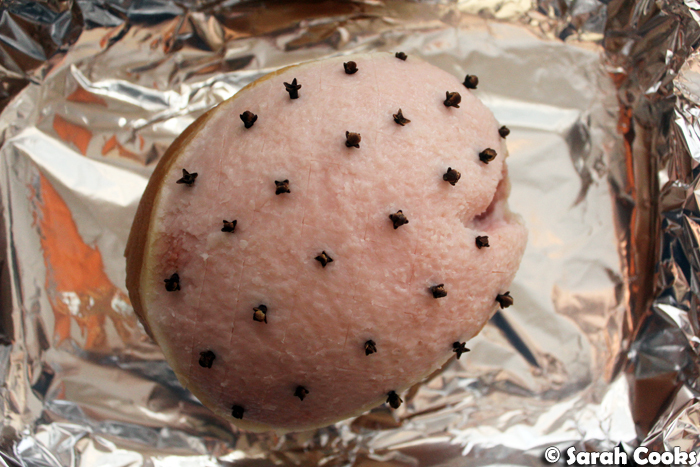 ...score the fat into diamonds and then stud with cloves. 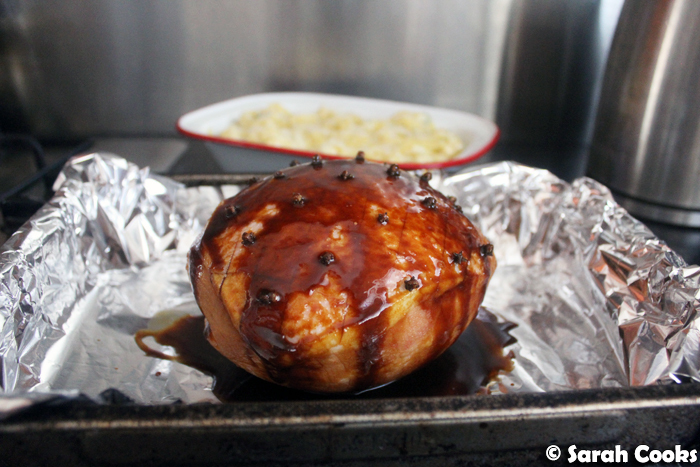 The glaze was Nigella's black treacle glaze (equal parts black treacle and demerara sugar, with a little mustard), which comes from Simply Nigella. As the hams we get here are always cooked, no need to do the slow-cooking, just glaze and bake until hot all the way through. Most recipes I saw said to cook the ham at 160C for 15-20 minutes a pound to get it to an internal temperature of 140F/60C; I found it took quite a bit longer. A meat thermometer is your friend. (Or at least a skewer or sharp knife to test that it's hot enough for you). Side note: I ran out of demerara sugar, so I used dark brown sugar this time. And I liked it much better! 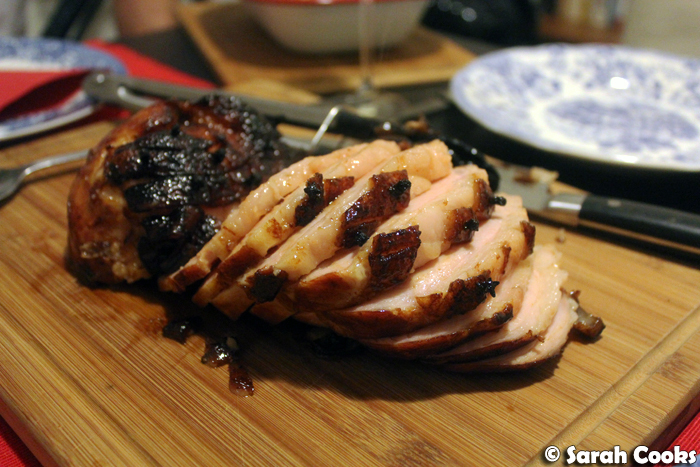 The glaze was thicker and less grainy, and adhered to the ham better. (Although you can see that it did dribble off quite a bit). The sides! 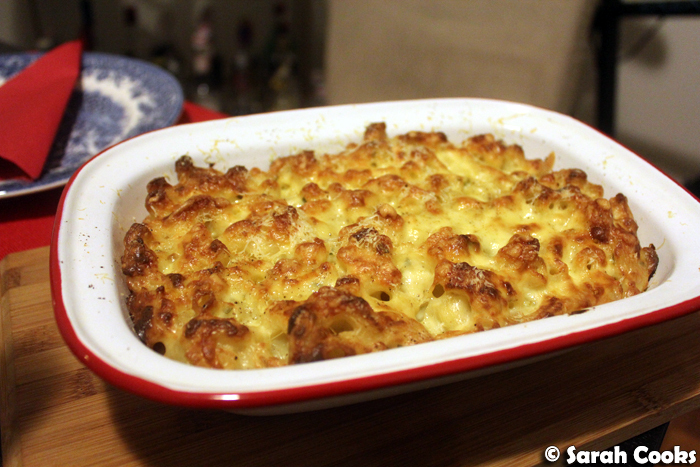 First up, Tyler Florence's ultimate mac and cheese, obviously minus his pea and bacon topping. (Recipe available here). It's a standard mac and cheese - elbow macaroni and a white sauce, with a little parsley folded through. Classic and delicious! 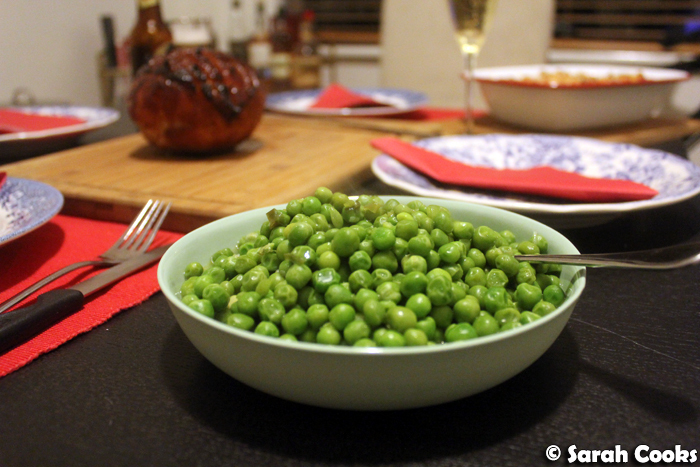 Petits pois à la Française - I make this so often that I forgot which recipe book it came from. Turns out it's Nigella's Feast, from the Valentine's Day chapter! What we're doing here is cooking spring onions in a little butter, then adding peas and chicken stock. (She instructs you to add a chopped little gem lettuce; I rarely bother). 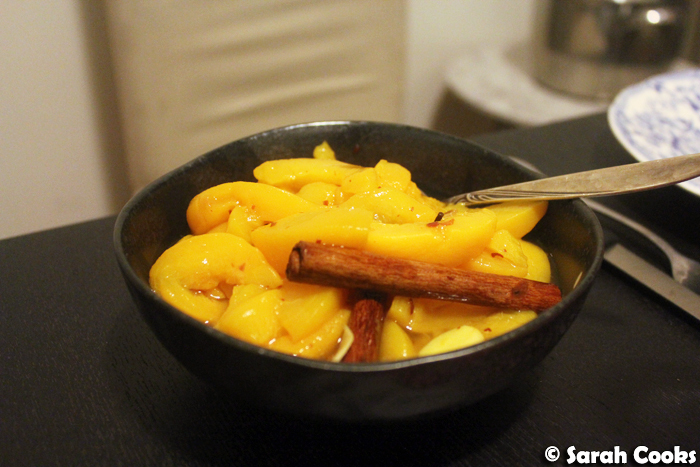 Spiced peaches! It's getting harder and harder to find peaches in syrup, rather than juice, but I managed to find a single brand at my supermarket, in a big 800 gram tin. These take about five minutes to make - peaches and syrup, vinegar, chilli, ginger, cinnamon, peppercorns and cloves - and they go so well with the salty ham. My traditionalist German father-in-law hadn't tried the sweet-and-savoury combo before, and thought these were unusual, but ended up taking three servings. Woohoo! 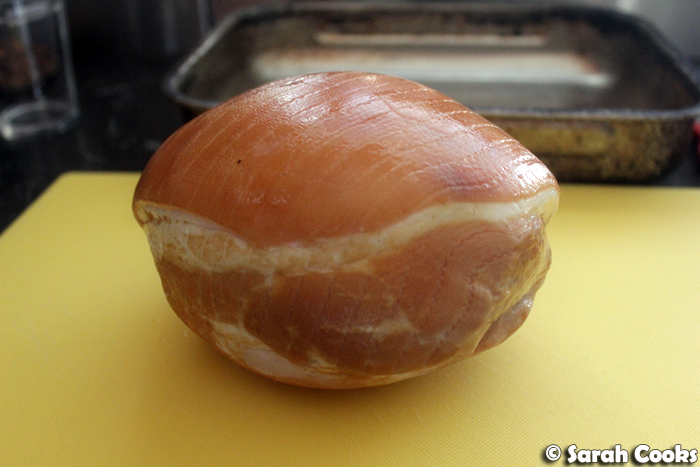 And here's the sliced ham. Gosh, I love the sweet sticky glaze. Tomorrow we're doing the whole turkey shebang. Can't wait! Merry Christmas, everybody!